I have created something called Canvas & Cribs. I paint one-of-a-kind personalized, beautiful home portraits on canvas for real estate agents gift to their clients whom they have created solid relationships with. However, this is a wonderful gift to yourself of your own home or created for someone you love. Our homes are as unique as we are. 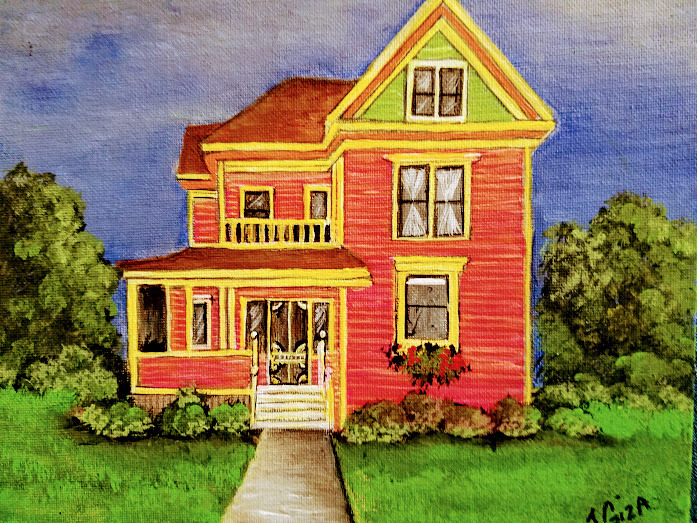 A home portrait from you to your client, or loved one, whether it be of their former loved home or the new home they will be moving in to, is hand painted on a 9X12 or 8X10 canvas, signed and shipped directly to them or to yourself for expressing your gratitude personally. Your name and company information is sealed on the back. This thoughtful keepsake to be treasured for years to come, holding the agent-client relationship beyond the sale, becoming a source of new and repeat business in the future. This is simple, honest and organic…. Just email a picture of any home, office or building. I will crop, edit and tailor the image to be most pleasing. Send the name and address to where to you want the art sent. An invoice is sent each month for the number of framed art you’ve ordered. That’s it! The total cost is $125.00. Special considerations for any client or home you may have will always be accommodated such as larger canvas, etc. if the situation presents itself. Anything is possible! Email a picture of the home you wish to have featured on your canvas. Your image will be edited, cropped, etc for best layout. Feel free to contact me with any questions!